We can’t seem to pinpoint the why of custom printed blankets and their effect on the human psyche, but one thing’s for sure: we tend to light up when offered a blanket. Especially with the cold coming like it is. They’re big. They’re comfy-looking. They’re warm. Blankets have that psychological and emotional effect, so they make for great gifts! Imagine what you can do with custom printed blankets as fundraisers! You’d rake in the dough for your nonprofit…. This is about branding. And you have to go the extra mile. Yes, a donor will appreciate a beautifully crocheted blanket…. But you want the message behind it to stick in the minds of those donors, remembering what they’ve done. Look at the Wounded Warrior Project, after all: they do exactly that. The cause is just as important as the gift. The meaning behind those words — it means something to many people. As a nonprofit, you want that message to stick. That’s why custom printed blankets with the logo of your foundation will help spread the word beyond the voice or contribution. That blanket will permanently become a part of that household for decades. You’ve made your mark. You’ve entered into the home of a supporter for your cause, and you’ve left a piece of your heart behind for that person to uphold for the rest of his/her life. And it’s all because of a blanket! That’s saying something…. That’s just the start. Click here for more ideas. You can supercharge this premium product for your promotional needs with such creativity that it’ll blow your mind. And these are products lasting a lifetime. For more information about some of the variations we have, click here. When you’re ready to contact us, all you need to do is say when. From BRAVA Marketing, we thank you. Why Not Celebrate Your Devotion to Your Team by Getting a Blanket Embroidered With the Name? Can you imagine sitting there at Progressive Field for the Indians with a blanket labeled with the awesome logo? Maybe you like football: get a blanket printed with the labels of the Miami Dolphins to remember just how beautiful it is there in Florida while you’re in the cold of Green Bay, Wisconsin (love those cheeseheads). Watch the cameras pan to you as you cheer while wrapped up in a big Chicago Blackhawks blanket! There’s nothing better, nothing else to get you in the mood more as you cheer for your team. Simply put, if you are a diehard fan, this is something you can’t miss out on. You can go to countless stores and miss out on the merchandise, but right here at BRAVA Marketing, it’s all here for you. Simple. Nothing says devotion to your sports team like a great custom blanket especially when you love sitting there at the games. Get some hot chocolate. A hot dog. And your blanket. And if you want to paint your face blue, red, yellow, or whatever, go for it. Save your strength while you’re out in the cold. Let everyone know who you’re rooting for. That custom blanket’s pretty big. And so is your devotion and determination to see your team win big. 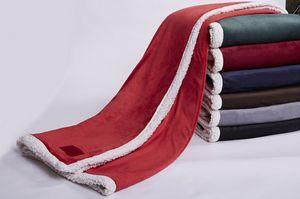 Check out all the options we have for blankets, plus contact us today. You can learn more about the uses for custom blankets by clicking here as well. Watch out for that touchdown. Winter’s coming. That’s what those Starks would say while playing the game of thrones, but one thing’s for sure: while winter’s coming, we’re waiting with our promotional blankets to keep warm! Promotional? What’s the big deal, though? A blanket’s a blanket a blanket wherever you go. Who cares what’s written on it as long as it keeps you warm while you’re asleep. The fact is this: there are plenty of reasons why you’d want a promotional blanket , and it transcends the functional in a big way. What About Company Picnics? — Sure, tables work just fine. The bad thing about tables is oftentimes they’re not branded either. Employee morale’s huge, so read this to find out why promotional blankets make a statement. Fundraising Gifts — Talk about clever. And useful. After all, the Wounded Warrior Project already does this. Why not you? Sports — Think about it, people. Since winter’s coming, you want to stay warm in other ways other than the mitts, hats and jackets. Here’s why. The fact is blankets have a wide variety of uses — you can sit on them, wrap in them, sleep with them. You can bring them to the beach, to the park, on a road trip. They are enormously useful. So why not brand them for your business and organization? Promotional blankets arguably sit way up there as some of the premier ways to market your logo, whatever it may be — fraternities, sororities, nonprofits. Not one group’s exempt from the benefit of the blanket. Remember that the next time you cuddle up with your Lannister blanket while resting in King’s Landing. The game of thrones will begin. And you’re going to get cold as winter comes. Check out our selection of promotional blankets right here as well as more options for other high-quality promotional merchandise and custom-printed products from BRAVA Marketing. Don’t forget to contact us today for all your promotional needs!